…If it doesn’t open with that “In Color” tag, it really feels like we’re missing something, doesn’t it? It’s a toe-tapper for sure. When I was a kid, I heard from someone, somewhere, that Miles Davis composed the theme. Turns out I likely received this info as the result of a real-life game of “telephone,” as the original rumor (that I can only assume was the basis of the Miles Davis rumor that eventually found its way to me) was that it was composed by a different jazz legend, Charles Mingus. In any event, neither one had anything to do with it, as the actual composers were P.D. Francis, Bob Harris, Stu Phillips, and D. Kapross. The anniversary of this show probably hasn’t gotten the attention it deserves, though there are a couple of great articles courtesy of 13th Dimension here and here. But even putting my admittedly subjective bias aside, it’s just a great show. The entire first season is must viewing for any Spidey fan out there, as it really captures the flavor of the original Lee-Ditko issues. (And in several instances adapted some of those stories quite faithfully.) My fave was probably “The Menace of Mysterio,” which was practically a note-for-note retelling of “The Menace of… Mysterio!” from Amazing Spider-Man #13. A short time after, they brought Mysterio back for a television-original story, “Return of the Flying Dutchman,” which was another fave. With seasons two and three, they changed production houses (with a young Ralph Bakshi taking over) and the series became another beast entirely, with many episodes feeling like wild, acid-fueled fever dreams. Some have this has a so-bad-it’s-good flavor; while at other times (alright, most times), they’re just plain bad. But they do have Gray Morrow art and designs, which gave it a fresh feel—though granted, they continued to re-use (and re-use and re-use and re-use) stock footage of Spidey swinging around town from season one, offering some illusion of continuity—and gave these episodes at least some unique appeal of their own. There were a few instances where they adapted some original comic stories. Or tried to. The most obvious example being “The Origin of Spider-Man,” which takes a whole lot from Amazing Fantasy #15. One of the big things they got wrong though was near the very beginning, when Peter Parker is supposed to be portrayed as an outcast. In the comic, the kids exclude Pete from their reindeer games without giving him so much as a second look. But in the cartoon, Pete is the one begging off hanging out with the popular crowd so he can attend a science exhibition—only then do the popular kids deride him as an egghead. This was a bad misstep. But at least Bakshi’s heart was in the right place. Other comic adaptations from these latter seasons include “King Pinned” (featuring the Kingpin, the only freshly-imported villain taken from the comics in these seasons, in a story loosely adapted from ASM #51, “In the Clutches of… the Kingpin!”), “To Cage a Spider” (ASM #65, “The Impossible Escape!”), “The Big Brainwasher” (ASM #59, “The Brand of the Brainwasher!”), and “The Madness of Mysterio” (ASM #66, same title). In closing, let’s circle back to the music. Because those scores were damn near as perfect as the theme song. Note that I refer to “scores” in the plural because the score changed when the producers changed; so the score for the last two seasons was different from that of the first season (though that awesome opening theme song remained unchanged, thankfully). Again, for those keeping score (no pun intended) at home, that’s three seasons, two different scores. Ten years ago, WFMU put up an in-depth blogpost about those scores here. If you’d prefer to cherry pick those tracks, you may do so here. While I would rate the season one score the best, seasons two/three ain’t chopped liver. 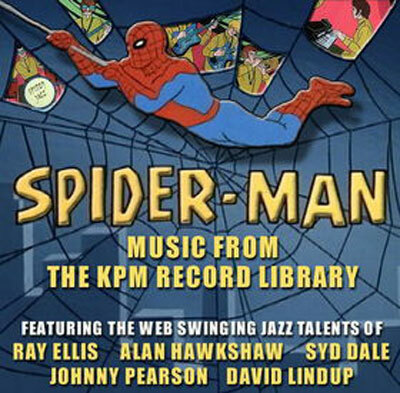 Based on this image I found, at some point the score music from these seasons appears to have been released as Spider-Man: Music from the KPM Record Library. I found one blogpost with a long list of track titles from this set (one of which was “LSD”—like I said, some of those later episodes were seriously trippy). Of this particular lot, “Hellraisers” is probably my favorite. Looks like most of this music is available on iTunes here. I’ll wrap up this post by sharing a youtube compilation of theme songs from every TV iteration of the web-head from 1967 to 2012. Happy Golden Anniversary, Cartoon-Spidey!